Military surplus masts are great for temporary antenna supports for Field Day and other activities. They are easy to put up, rugged and transportable. They come in 3-5’ sections and telescope into each other. Stack them up one by one until you get the desired height. I am a sucker for the stuff and am constantly adding to my collection. This page gives some hints on selecting and using military masts. I bought most of mine at Dayton over the years. There are usually a couple of vendors each year with large selections. 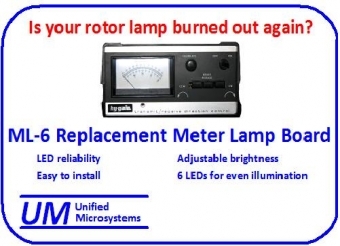 It shows up occasionally at local hamfests, and there are some vendors on the Internet. I have several different styles of masts and each has its own advantages and disadvantages. They are made of two types of materials, aluminum and fiberglass. The aluminum ones are lighter and stronger, but sometimes you want the support to be non-conductive. 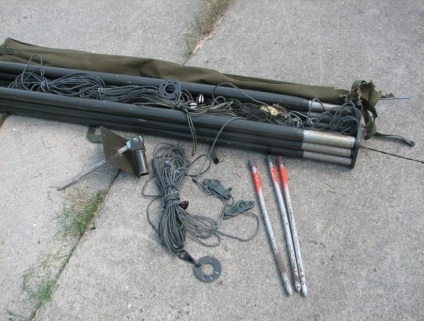 Figure 1 shows some of the types of mast I have. Figure 1. From top: Fiberglass with reinforcing ring. Fiberglass with reinforced bottom. Ribbed aluminum mast. Thin walled, larger diameter aluminum mast. My favorite is the AB-155 kit. 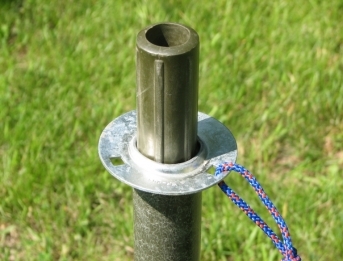 It consists of eight aluminum 5’ poles, guy rings, stakes, guy ropes and a pivot base. The set includes some metal end brackets to hold the poles together for storage and transport. The poles and end brackets form a U shape. The other parts go inside and a canvas cover keeps them in place. Set up starts with pounding a stake on the pivot base into the ground. Then you slide the pole sections into each other with the circular guy brackets at strategic points. The guy ropes clip on to the brackets. The bottom slides into the pivot base and the pole is walked up. I have put it up by myself, but that is quite a task and you need to have the stakes in just the right spots and the guy ropes pre-adjusted just right. I would not recommend trying that. Normally 5-6 people are used to put it up and take it down. The AB 155 is designed for 4 guy wires at each level. I usually don’t put it up to the full height and don’t put that much of a load so I only use 3 guy ropes at each point. For erection, one person is on each set of the 3 guy sets and 2-3 more walk the pole up. It tends to bow a lot before it reaches the 45° point and the guy crew should try to minimize that bending by putting tension on the guy ropes. The AB 155 has some really slick guy tensioner mechanisms. They are sort of hard to figure out how to use, but once you do, you really appreciate how great they are. My hat is off to the designers of the AB 155. It is really slick how everything goes together. If you are in the market for military mast and find one in good condition at a good price, pick it up! They don’t show up often and the last one I saw was about $125. The other masts I use came as just pole sections and I needed to come up with the guy parts and stakes. I have several different styles. Of these, the ribbed aluminum ones are my favorite. They are very rugged. Some fiberglass masts have sleeves on the receiving end. If you have a choice of fiberglass mast, get the ones with the sleeves. Fiberglass masks can’t handle much side stress without splitting. I had some of mine split when they were not handled properly. After that happened a few times I strengthened them. I took some nylon string and wound it tightly around the base until I had a couple of inches wound. Then I covered it with a few coats of fiberglass resin. This is the stuff used to repair fiberglass boats. I have not had any split since I did that, but I still use a lot of care in setting up and taking down these masts, and don’t use them in situations where there will be much side stress. For stakes, I use 1” conduit. I use a 4’ piece as the base and 3’ pieces for the stakes. I spray the ends with orange paint so they are easy to find in tall grass. The 4’ piece is pounded into the ground about ½ way in where I want the pole to be. 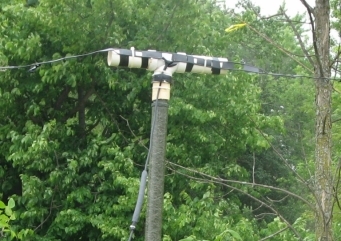 It is not really there to support the pole, but just to prevent it from sliding. You can sometimes find guy rings for the mast, but it they tend to be expensive. I found an inexpensive alternative. I use brackets for mufflers that I found at a local farm supply shop. I think they were under $2 each as opposed to about $14 or so that the real ones list for. They already have 3 holes punched just ready for tying the guy ropes to. Depending on the size of your mast, you might find the center holes are just a tad too large. There is a roll on the metal to strengthen it around the center hole. Just pound that down a bit with a hammer and the hole closes up enough for a perfect fit. 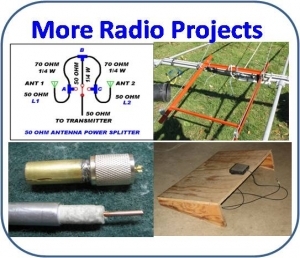 You will need a way to hold the dipole center point to the top of the pole. I found PVC pipe or TEE fittings work well. The TEE fittings are fine for the fiberglass poles. If you are using aluminum mast you will want to provide a bit more distance to prevent coupling between the antenna and the pole. A 2’ piece of PVC will do the trick. The AB 155 is strong enough to assemble on the ground and walk it up. You could probably walk up 20’ or so of the ribbed aluminum mast but if you try that with the fiberglass mast it will split. I start by pounding the 4’ stake and then sliding a section of mast over it. You can pound one of the short stakes a foot or so away and slide another pole over it. Pull up the main mast off its support stake and place it on the ground while holding it vertically. Then pull the other mast section off the short stake and slide it over the main stake. Then pick up the main pole and slide it onto the piece put on the main stake. Repeat the process until you get all the sections up. I can go about 20’ by myself with this technique. Once you get beyond that or if you have a larger antenna at the top you will need a couple of people to lift the pole each time. Figure 5. Left: AB-155 supporting a 40 meter dipole. Right: 40 meter inverted L with elevated radials. For quite a few years I have specialized in 40 meter CW at Field Day. Currently my antenna arsenal includes a dipole supported by the AB-155, a wire inverted L vertical supported by fiberglass mast, and an NVIS dipole also supported by fiberglass mast. 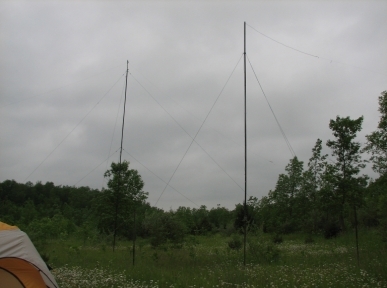 Surplus military mast is a great method to support your Field Day wire antennas or small VHF Yagis. It is designed to be easy to transport and set up. Keep an eye out for some at the next Hamfest.